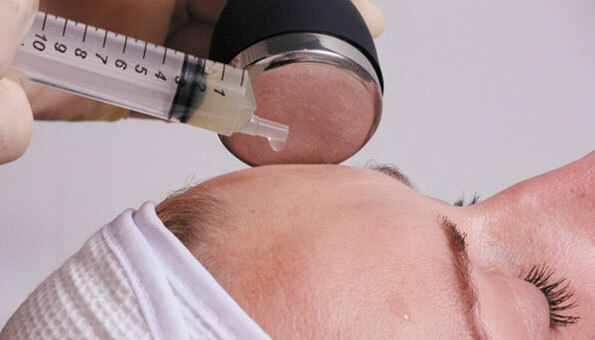 Meso-Btox is “The needle free alternative to Botox injections” This is a new highly effective and totally non-invasive treatment where we combine Mesotheraphy with our “Ultimate toning” treatment, providing Non-Surgical face lifting. This combination gives maximum results for our clients. We use a Needleless Cryoderm machine coupled with our Ultimate Toning machine. Visible effects are noticeable immediately after the first treatment. Every further session intensifies the effects with the skin becoming smoother, more elastic, brighter and healthier. Microdermabrasion is a deep exfoliating treatment. The skin’s surface is polished and the top layer of dead skin cells removed, revealing new living cells, whilst restoring a healthy refreshed glow. The epidermis layer of the skin is rejuvenated, meaning collagen production is stimulated. This leaves your skin feeling plumped and minimises the appearance of fine lines and wrinkles. We use Dermal Aesthetics, advanced skin technology, Cryoderm Diamond Tip Abrasion system. This is a non-invasive method of rejuvenation by means of mechanical exfoliation without the use of aggressive crystals, chemicals or laser. By gently working away tired aged surface skin layers, you will be enabling new skin cell regeneration, which can dramatically improve surface skin texture and appearance. This leaves skin looking rejuvenated and radiant whilst, at the same time, reducing fine lines and wrinkles. Exfoliation happens gradually and since the diamond tip heads are available in 3 different grades, treatments are accessible to all skin types regardless of sensitivity levels. The non-surgical face lift treatments we offer use dual output alternating faradic and galvanic micro-current to allow us to achieve both facial toning and improved circulation. Using both faradic and galvanic micro-current, enables us to stimulate muscle fibres to achieve a toning effect and improve the surface skin texture. The current is used at an intensity to bring maximum results in minimal time with minimal discomfort. When using the galvanic micro-current alone it improves the circulation to both the skin and the muscle cells, improving the surface skin appearance. The treatment involves systematically moving probes facial point to facial point, gently lifting and toning the 12 essential zones of the face. A facial to reduce the appearance of fine lines and wrinkles while improving overall muscle tone. An eye treatment to reduce fine lines dark circles and puffiness. Brows are lifted to effectively open and awaken tired looking eyes. A treatment concentrating on the neck and upper chest area to refine skin tone, improve texture, soften and tighten skin. A combined deep muscle toning and lifting treatment applied to areas of the face and neck. The treatment is used for a quick boost to provide an immediate noticeable lift before an evening out.